Phylloxera are small pear-shaped aphids (using 'aphids' in the loose sense, phylloxerids are not 'true' aphids). Both the sexual and parthenogenetic females are oviparous. The wings are held flat over the abdomen at rest. The ovipositor is vestigial or absent. Phylloxera feed on plants in the walnut (Juglandaceae) and oak/chestnut (Fagaceae) families. Phylloxera glabra fundatrices feeding on oak leaves in spring causes the leaf edges to curl inwards. Feeding by later generations causes necrotic spots on the leaves (see first picture below). 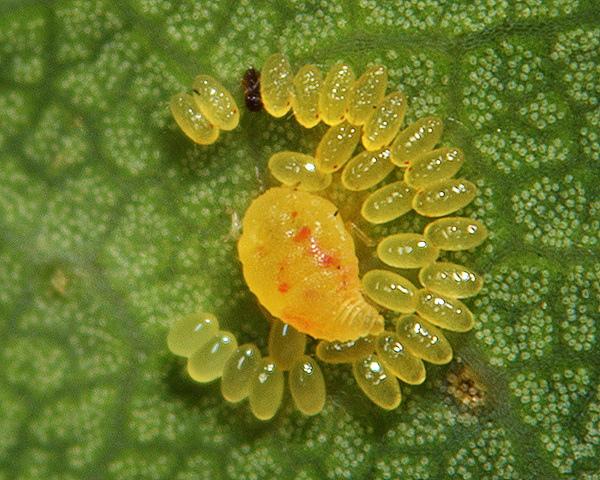 The yellowish orange adult apterae feed on the undersides of the leaves (see second picture below of adult with eggs). The dorsal processes of the aptera are undeveloped, and the tergum (=thickened dorsal plate) is nearly smooth (cf. Pylloxera quercus sp. group, including Phylloxera coccinea, which have club-shaped dorsal processes on the thorax). The primary rhinarium on the third antennal segment is subapical (=below or near the apex) with the terminal process developed. Abdominal tergites 2-5 have spiracles. The Phylloxera glabra adult body length is 0.7-0.85 mm. 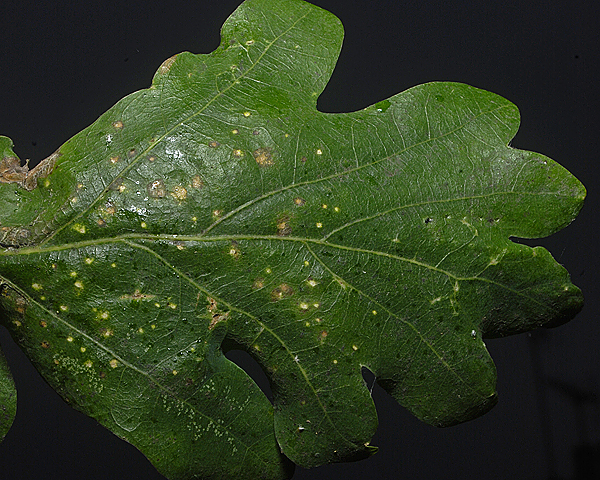 The oak leaf phylloxera lives without host alternation on oak leaves (mainly Quercus robur). Female Phylloxera glabra surround themselves with concentric circles of their eggs (see picture above). After hatching, their nymphs wander off leaving gaps in the circle, or if disturbed, the adult female may leave. Phylloxera glabra is found in Europe, and has been introduced to New Zealand.